The internationally acclaimed London-based Elias String Quartet brings its reputation for performing with “exuberance and fire” to the Lawrence Memorial Chapel Friday, Feb. 3 in the second concert of Lawrence University’s 2016-17 Artist Series. Hailed as one of the leading ensembles of their generation, Elias will feature Beethoven’s “String Quartet in F minor, Op. 95,” Kurtág’s “Moments musicaux for string quartet, Op. 44” and Mendelssohn’s “String Quartet in A minor, Op. 13” in its Lawrence performance. 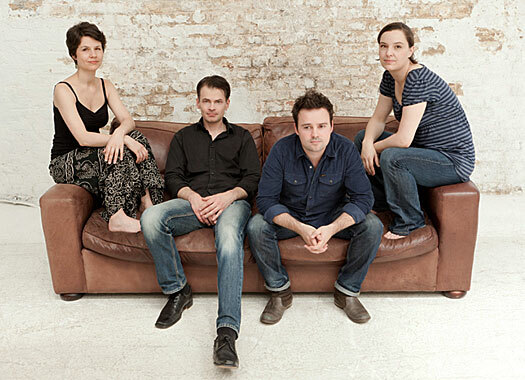 A product of Manchester’s Royal Northern College of Music in England, the quartet has evolved from student group to professional ensemble, earning raves for its artistic excellence after bursting on the scene in 1998. Since then, they have performed around the world, collaborating with many of the best musicians in the world’s most revered venues. In 2015, the quartet — violinists Sara Bitlloch and Donald Grant, violist Martin Saving and cellist Marie Bitlloch, Sara’s sister — finished its ground-breaking Beethoven Project, which saw it record and perform the composer’s complete set of works for string quartet. Passionate about playing new music, Elias has premiered works by contemporary composers Sally Beamish and Colin Matthews of the UK, Matthew Hindson from Australia and American Timo Andres. In addition to the Beethoven project, their discography includes Mendelssohn and Britten as well as an album of French harp music and Schumann and Dvorak piano quintets with Jonathan Biss. Remaining performers on this year’s Artist Series line-up include Mnozil Brass, March 29, and Roomful of Teeth, April 7.